JERUSALEM (CNN) -- Roughly half of Israelis support bombing Iran's nuclear facilities if international efforts fail to stop the Islamic republic from developing nuclear weapons, according to a Hebrew University poll released Sunday. 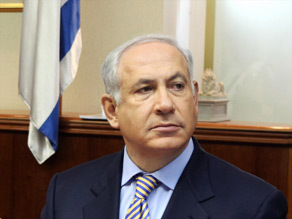 Israeli Prime Minister Benjamin Netanyahu plans a major speech on peace and security. Some 52 percent of Israelis say the country should bomb Iran's nuclear reactor, while 35 percent are against, the poll found. The margin of error in the poll of Israelis is 4.5 percentage points. Palestinians are somewhat more evenly divided, with 43 percent saying a nuclear Iran would be good for the Arab world and 33 percent saying it would be bad, according to the Palestinian Center for Policy and Survey Research in Ramallah, which conducted the poll along with Hebrew University. The margin of error for the Palestinian sample is 3 percentage points. Hebrew University released the poll shortly before Israel's Prime Minister Benjamin Netanyahu was due to make what he called a major speech to lay out his plan for the country's peace and security. "We want to achieve peace with the Palestinians and with the countries of the Arab world, while attempting to reach maximum understanding with the United States and our friends around the world," Netanyahu said on June 7 in announcing the speech. "My aspiration is to achieve a stable peace that rests on a solid foundation of security for the State of Israel and its citizens." Netanyahu, of the center-right Likud party, has pointedly refused to endorse a two-state solution. President Obama in Cairo endorsed a two-state solution and urged compromise between "two peoples with legitimate aspirations." Obama repeated his call for both Israel and the Palestinians to fulfill all obligations under the 2003 roadmap to peace, including a halt to any expansion of West Bank settlements by Israel. He also dispatched special envoy George Mitchell to the region to try to kick-start the negotiating process. He called America's bond with Israel "unbreakable" but also rejected the legitimacy of continued Israeli settlements and said Palestinians have suffered in pursuit of a homeland. He also called for an end of Palestinian incitement against Israel, and greater security in Palestinian territories. Hebrew University surveyed 606 adult Israelis by phone in Hebrew, Arabic or Russian between May 24 and June 3. The Palestinian sample size was 1,270 adults interviewed face-to-face in the West Bank, East Jerusalem and Gaza Strip in 127 randomly selected locations between May 21 and 23.